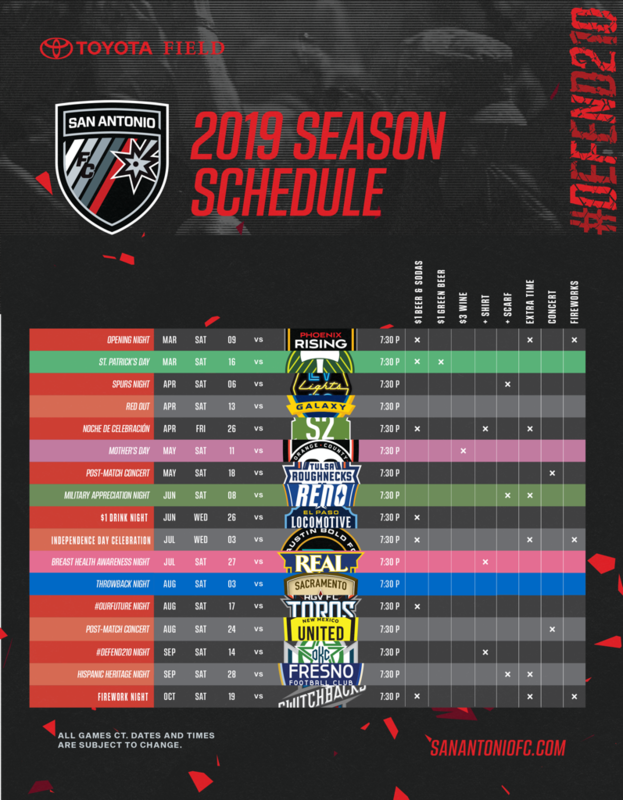 San Antonio FC today announced its 2019 promotional schedule, including theme nights, giveaways, drink specials and more for each regular season home match. The full promotional schedule can be found on SanAntonioFC.com. Single game tickets starting at $10 will be available for purchase to the general public beginning Wednesday, Feb. 6 at 10 a.m. 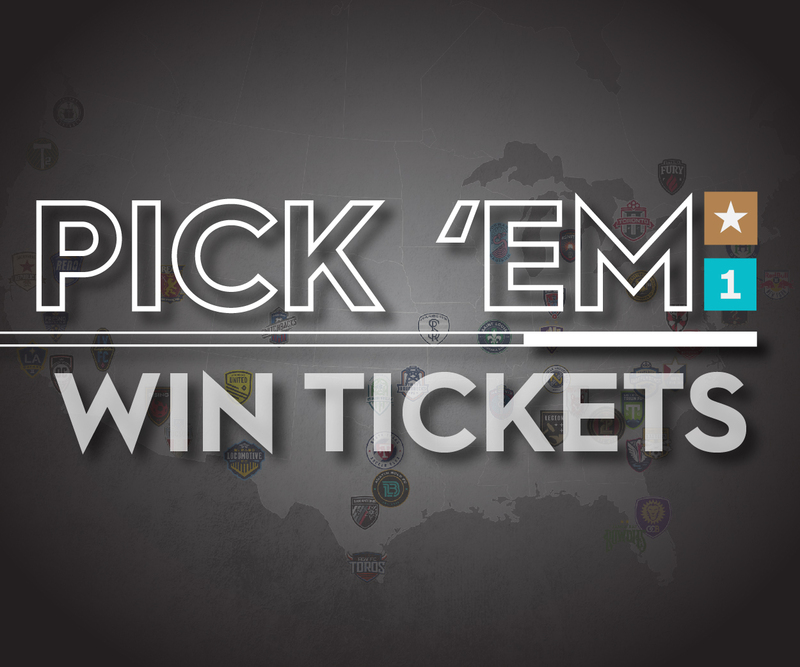 Season Ticket Members can purchase additional single game tickets through an exclusive presale beginning now, while supporters who follow SAFC on social media will have access to a presale link beginning on Tuesday, Feb. 5 at 2 p.m.
SAFC will host Phoenix Rising FC in the club’s season opener presented by H-E-B on Saturday, March 9. The night will be the first Bud Light $1 Drink Night of the season and will include a postgame fireworks show during ‘Extra Time’ -- the official SAFC postgame party which features live music, games, $1 beer and sodas, and more. On Friday, April 26 the club will join celebrations around the city as it hosts Noche de Celebración presented by KENS 5, against Seattle Sounders FC 2. SAFC will offer a ticket + t-shirt package to the match as well as $5 margaritas on the rocks and $1 beer and sodas during the match. SAFC will host Military Appreciation Night presented by Toyota on Saturday, June 8, featuring ‘Extra Time’ as well as rally towel giveaways. The club will then celebrate Independence Day with Bud Light $1 Drink Night and a postgame fireworks show during its Central Texas Derby match against Austin Bold FC on Wednesday, July 3. Breast Health Awareness Night presented by Methodist Healthcare is set for Saturday, July 27. Fans interested in more information on the full San Antonio FC promotional schedule as well as individual or season tickets can visit SanAntonioFC.com or call 210-444-5657. Supporters can stay up to date on the club by joining the Fan Club, or following on social media by liking San Antonio FC on Facebook, as well as following the team on Twitter (@SanAntonioFC), Instagram (@SanAntonioFC) and Snapchat (@SanAntonioFC).